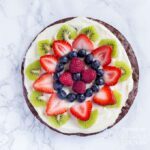 Make a delicious brownie fruit pizza for your next party or get together. Fresh fruit, cream cheese frosting and a chewy brownie base speak for themselves! This recipe makes two small 'pizzas' in 8inch round pans. Preheat your oven to the temperature stated on the brownie box mix. line two 8in cake pans (removable bottom pans only!) with parchment paper otherwise you will find the brownies bases will stick to the pan, even if they are non stick pans. Prepare the brownie mix according to the instructions on the box, then divide it evenly between the two lined cake pans and spread it to the edges to make the pizza bases. While the bases are cooking prepare the frosting by adding all the ingredients to a mixing bowl and blend until combined. Prepare your fruit by cutting it into thin slices. When the brownie bases have cooked remove them from the cake pans before they cool, otherwise they may stick to the sides. Wait until the brownie bases are fully cooled before you move them off the base of the cake pans, they may be too soft to move while they are still hot and may fall apart if you try. Once the bases are fully cooled, add the cream cheese frosting and then decorate with fruit, and serve. This recipe for Easy Fruit Pizza was printed from AmandasCookin.com - https://amandascookin.com/easy-fruit-pizza/ and can only be printed for education or personal use.